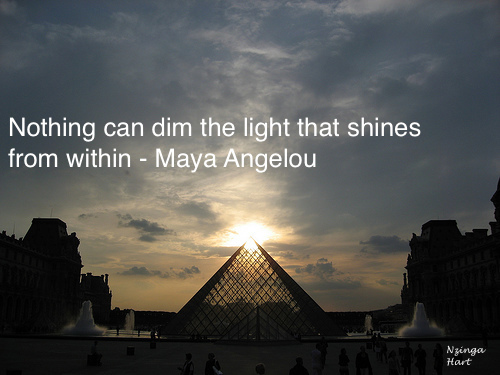 Nothing can dim the light that shines within you. 1. Have a day carved out for you: Pick a day out of the week where you cater to your physical, mental, and emotional being. Pamper your self in whichever way you see fit, even if it’s only for a few hours on that day. I enjoy doing a longer session of yoga, writing, listening to my favorite playlist and having a freestyle dance workout session, and watching movies/marathons with my husband. Having a YOU day is a great way to remember you are your closest friend. 2. Write/Draw/Speak your values: Your values become your priorities, and whatever you prioritize comes true. Knowing what your values are and checking back in with them on a regular basis keeps your focus centered so your drive can move forward. 3. Make your vision of the future be the wildest, most awesome, future your could possible choose. Successful leadership thrives on a motivating end-goal. If you are setting your sights to short then you may end up with a less then stellar destination. Go for the gold because your subconscious won’t find solace in the status quo. Personal leadership requires you to take into account the leader and the follower, which is why it is an excellent gateway to more advanced and complex levels of leadership. In addition, it builds your drive and motivation to go after where your leadership is best placed. Take time to remember your self-interests and make sure they align with your values, and you will be well on your way to your most abundant and joyous success.